what happened at ‘that’ school, part 1: how’s the boy doing? A year ago, I posted about why we’d chosen to send our son to the school over the road – despite Ofsted recently having put it in Special Measures*. One year on, here’s an update on how it’s gone. Forgive me if this ends up as a trilogy – there’s so much to say, so much I’ve learned, so many ways our family has been enriched over the last year. But I’ll start with the most important person in all of this: our son. In many ways, it’s hard to know what to write because this school is the only school we’ve sent our son to, so we have nothing to compare it to. Is it normal for kids in Reception to go on four school trips during the year? To have specialist PE and Spanish teachers? To learn in such fun, active ways? For the teachers to be THIS enthusiastic, first thing in the morning, when confronted with 30 tiny and excitable children? I chat regularly with close friends whose children are at different schools, so I get a fair idea of how ours is doing in comparison with the others, but actually it’s not really a matter of comparison. Each child is unique, and so is each school. What’s right for one might not be right for another. So the question really is: how has this school been for my son this year? Let’s start with the three Rs…not that academic skills are the only (or even the main) part of what school life is about, but this would be the standard concern of many parents when considering whether this particular school – this school which, up until a few years ago, was failing its children – is right for their child. 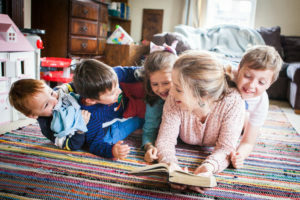 Will my child learn to read, ‘rite and do ‘rithmetic? Will he/she be held back by the weaker members of the class? Will he/she be excited by learning, and driven to fulfil his/her potential? By all accounts, Mister has had a brilliant year. All of his ‘academic’ skills are unrecognisable from a year ago. He’d reached the early learning goals by the time we had Parents’ Evening in March, and has ended the year exceeding in every area. This is not a boast, more of a puzzled shoulder shrug towards anyone who might have doubted this excellent school with their excellent staff, capable (as all teachers should be) of differentiating across a wide ability range. As a governor, I get to see statistics and data from all year groups, and I can confirm that this school is definitely performing as it should. The weaker students get an awful lot of extra help and support (surrogate parenting in some cases), and those who are flying get supported to do the absolute best that they can. Moving onto social and personal skills – has this school been good for Mister? Has it helped him to blossom, bringing out his unique skills and talents, whilst supporting the areas he finds harder? A year or two before he started school, we were concerned that he might be easily led, a follower rather than a leader, someone who might make wrong choices if prompted by others. Perhaps this was more because, by this stage, Mister’s younger sister was establishing herself as something of a feisty, no-nonsense kinda gal, so it was more by comparison that we wondered whether Mister would survive at school. You can understand, then, why I was in tears at Parents’ Evening when his teachers told us, unprompted, that he was a ‘leader’, ‘so confident’, and enjoyed initiating activities. Such an answer to prayer! He has settled brilliantly, with a good group of lovely friends, some of whom we’ve got to know really well through playdates and other activities. In short – Mister has thrived this year. We’ve seen his personality develop and strengthen, and discovered new interests of his, like searching for ‘minibeasts’, reading non-fiction books, and making ‘potions’! Then there are all the ‘extras’. Mister has an energetic and creative Spanish teacher, who only visits their class every few weeks but makes a big impact. He can offer you a few Spanish words, and count to 10. He adores his PE lessons with the school’s sports coach and gets particularly competitive over football. Forest Schools, and the opportunity to spend unhurried time appreciating nature, taking risks, and enjoying fresh air, has been a highlight of Mister’s weeks. Then there are the weekly celebration assemblies, the fun one-offs like Science Week and Red Nose Day, the Chinese food sampled for Chinese New Year, the many school trips, the beautifully inspiring open-plan space used by Nursery and Reception children…I could go on, and you probably could wax lyrical about the school your child attends too! The point is not that our school is better than any other – my friends’ children are fortunate to go to amazing schools too – but that it sits up there with the best. I refuse to become complacent about the excellence of the place, because all this fabulous educational provision was just not there a couple of years ago – and now it is. It’s brilliant for all the children in our community, including our son, and we’ve never regretted our decision. *OK – so, technically, because the school has become an Academy since receiving this rating, it is not in Special Measures. However, it is still awaiting Ofsted, so doesn’t yet have a rating as an Academy. You will be the first to hear when the school gets the brilliant recognition it deserves!